I’ve been a fan of Arlo wireless cameras since they came out with the first generation a few years ago. 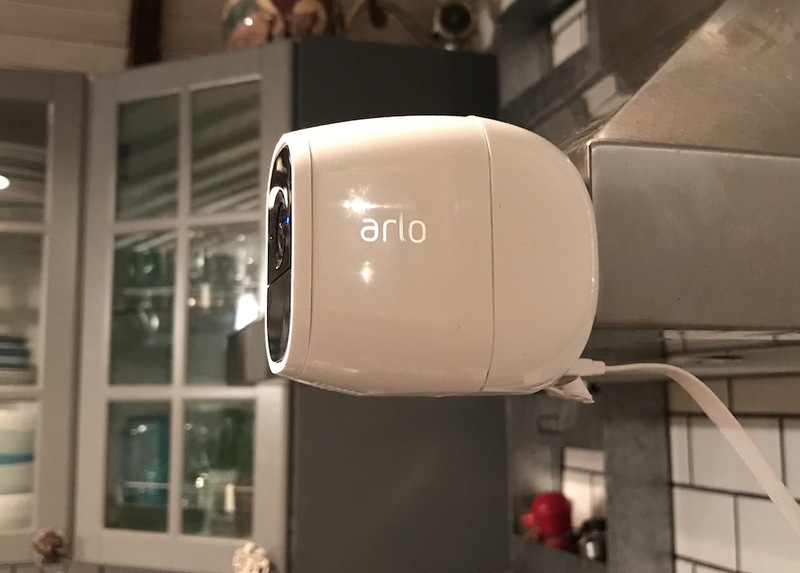 Because of their wireless design, long battery life, excellent video, and connection range, I credit my Arlo home security cameras with saving us from experiencing another break in after we lost thousands of dollars in property. The first generation of Arlo cameras are 720p with a completely wireless, waterproof design. They stream the video to your phone or tablet when they trigger motion. With Arlo Pro, Netgear added a new Hub that produces a siren sound if you press the alarm, and added two-way audio to the cameras. 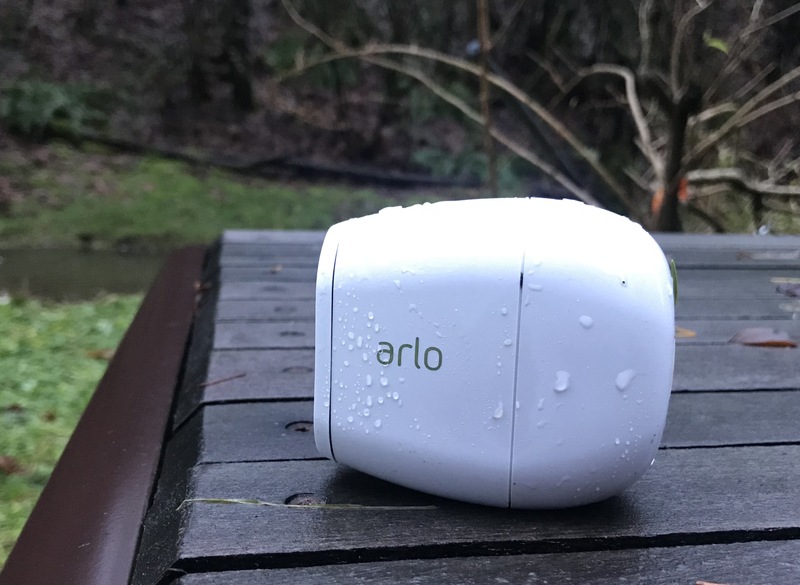 I own and have reviewed both the Arlo and the Arlo Pro, so when I was asked to test out Arlo Pro 2, I was all in. With Arlo Pro 2 home security cameras you get full 1080p HD video and base unit with an alarm/siren that’s so loud, it’s literally ear piercing when you’re in the same room. These cameras are also the first Arlo cameras that are indoor and outdoor, and there’s also a version of Arlo Pro 2 that’s packaged with a solar panel. I added the Arlo Pro 2 home security cameras to my Arlo network and tested them for the past two weeks. Here’s my thoughts on the latest generation of Arlo home security cameras. Arlo Pro 2 cameras are 100% wire-free and include rechargeable Lithium batteries, so you don’t have to worry about hard-wiring or plugging in the cameras to get them to work. They include a small, round metal sphere you can mount on your walls or home, and they attach to it via the built-in magnet. That extra-strong magnetic design also means you can place them on any metal surface in or outside your home and they’ll stay put. Arlo Pro 2 provides you with full 1080p HD resolution, 130-degree field of view, and has 8x digital zoom record. I wrote about how easy it is to install Arlo Pro cameras, and the set up process with Arlo Pro 2 is not different. If you take a look at my install video and walk through post, the process was exactly the same. Once you un-box the base unit, you connect it to your router and plug it into the wall. If you can, choose a room that’s central or near a door. That way if you hit the alarm it will be clearly heard everywhere in your home. The base station will need to be added to your Arlo app first. It’s a simple process that the app will walk you through. The cameras charge to full battery in about two hours. You can use the included charger to recharge them anytime they run low. These cameras will still operate until the battery is almost completely dead. When the batteries are charged, take the cameras to the base station, tap the sync button on both the camera and the base station, and your base station will add the camera. Once your cameras are added you’ll be able to mount them anywhere and interact with them via the app. Until you actually start using Arlo Pro 2, you can’t quite understand how perfect the view is from this Arlo home security camera. 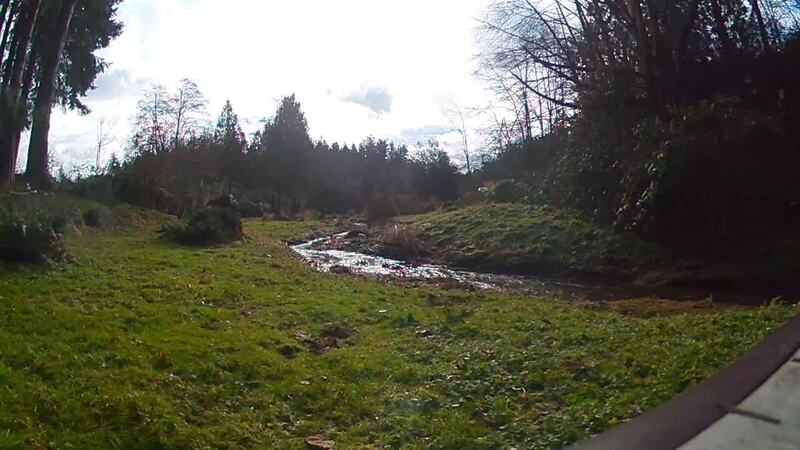 I’ve included several clips of the cameras at work in my yard and the 1080p HD clips are so crystal clear you can see the grass moving and stream rolling by as you watch. You don’t have to worry about them getting wet or if snow is hitting them, because they follow the IP65 waterproof standard. They are also rated to about -20, so they can stand up to those cold Canadian winters. Just keep in mind that the batteries will drain faster in colder weather. The sound is clear, and you can hear cars driving by on the road 200 feet away. Having the addition of sound makes these cameras even more useful, because if you do happen to see someone in your yard or home that’s not supposed to be there, you can hit the talk button and talk to them. I noticed that the video would pause when I zoomed in on a live stream, but the camera was about 200 feet away at that point so there may have been some Wi-Fi delay. The night vision on Arlo Pro 2 is very, very clear. Just keep in mind when you have your camera outside in an open area, rain drops or snow can accumulate on your camera and block your view. You’ll have to wipe down the camera lens once in awhile. Arlo Pro 2 cameras work inside too, and you don’t have to rely on your battery if you don’t want to. 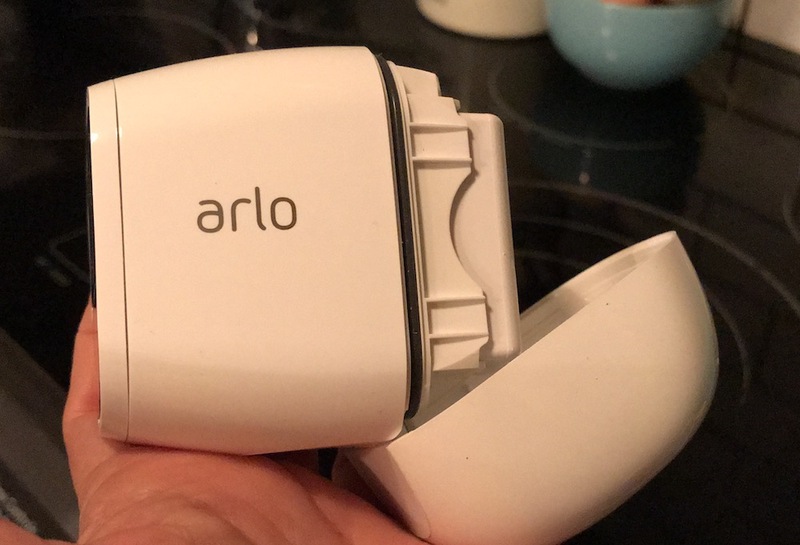 When you use Arlo Pro 2 inside you can plug them into the charger, and when they are plugged into the charger inside they have an extra feature. When the Arlo Pro 2 is plugged into power and it triggers sound or motion inside your house, it will record an additional three seconds of look-back video prior to the motion triggered. You’ll see exactly what led up to the motion. 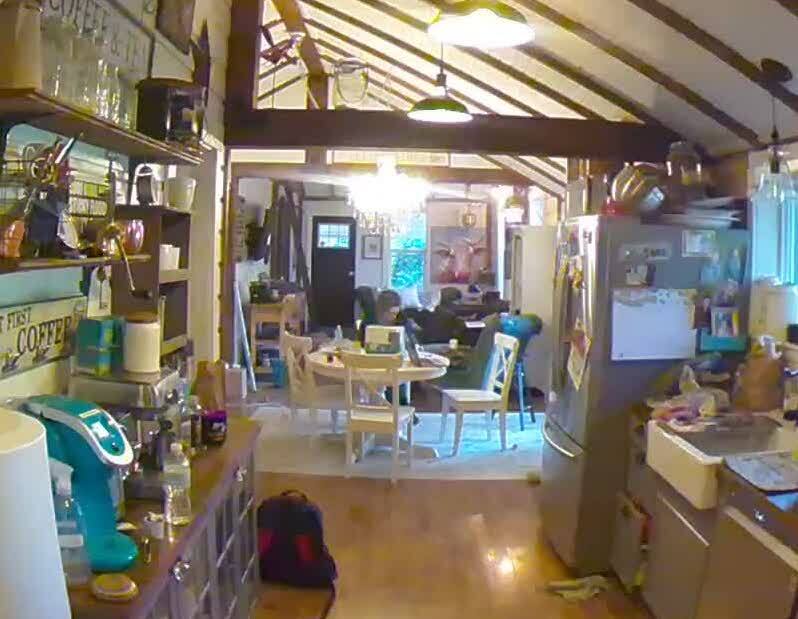 I popped one of my Arlo Pro 2 cameras on my range hood and captured a lot of indoor video. I found that the lighting in the room really affected the quality of video stream. It’s very clear, but I thought it was much clearer outside. The 2-way audio is clear and lag-free whether it’s inside or outside. I was very impressed with how clear the audio was when I hit talk. Battery life on these cameras varies so much that I can’t really put a number on them. I charged both until they were full and used them steadily for two weeks, and found that the outdoor camera dropped to about half battery life after that long. The indoor camera only went down by 1/4, so temperature and weather really do have an affect on the lithium batteries. Unlike the original Arlo that requires replaceable batteries, these quickly recharge within two hours. You can also purchase Arlo Pro 2 with a NETGEAR Arlo solar panel, so your cameras will always be fully charged. How loud is the Arlo Pro 2 siren? Way back when I installed my first Arlo camera, I only had two things on my wish list for these cameras: sound, and an alarm to scare someone off if they were on my property. 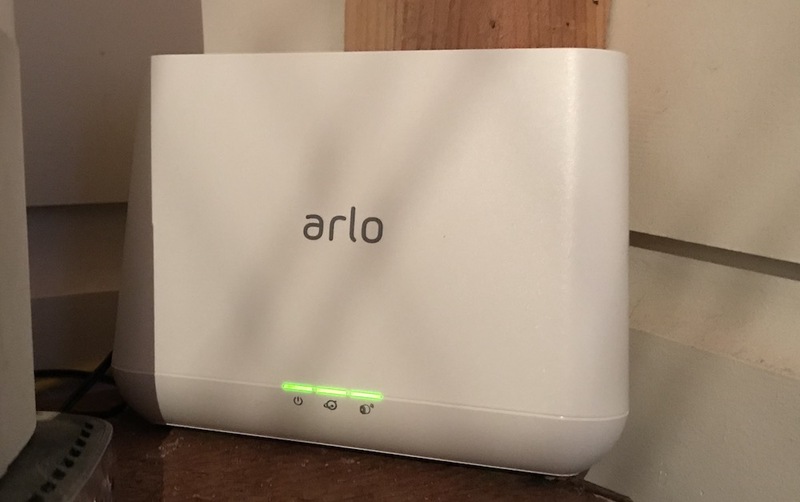 They addressed both of those issues with Arlo Pro, but because the siren is hooked up to my router, I couldn’t have it by the back door where I thought it would be the most useful. With Arlo Pro 2, the base station/siren is still plugged into my router, but they must have increased the volume on the siren because wow, it’s actually ear-numbing if you are in the room with it. You can hear it all over the house and outside, and after I recorded a quick video clip of it while sitting next to it, I left with my ears ringing. That’s exactly the type of siren/alarm you need if someone is lurking around your home. Arlo home security cameras are one of the few home security cameras with a free cloud storage plan. When you install your Arlo Pro 2 you get a free Basic subscription plan that includes seven days of cloud-based video storage. You can connect up to five cameras on one basic account. The Arlo Premier subscription plan costs $9.99 USD per month or $99.99 USD per year. It gives you 30 days of cloud storage and you can connect up to 10 cameras. There’s also an Elite plan for $14.99 USD per year or $149.99 USD per year. That gives you 60 days of cloud storage and support for 15 cameras. What these subscription plans won’t give you is CVR— continual video recording, but that is now an option with Arlo Pro 2 cameras. You can subscribe to 14 days of 24/7 recording for $9.99 USD per month or $99.99 USD per year, 30 days of CVR for $19.99 USD per month or $199 USD per year, or 60 days for $29.99 USD per month and $299 USD per year. This is an amazing option if you want to have a live security feed of your home or yard, but keep in mind that if you have several cameras hooked up that are constantly uploading video to the stream, it could really eat into your monthly home bandwidth. 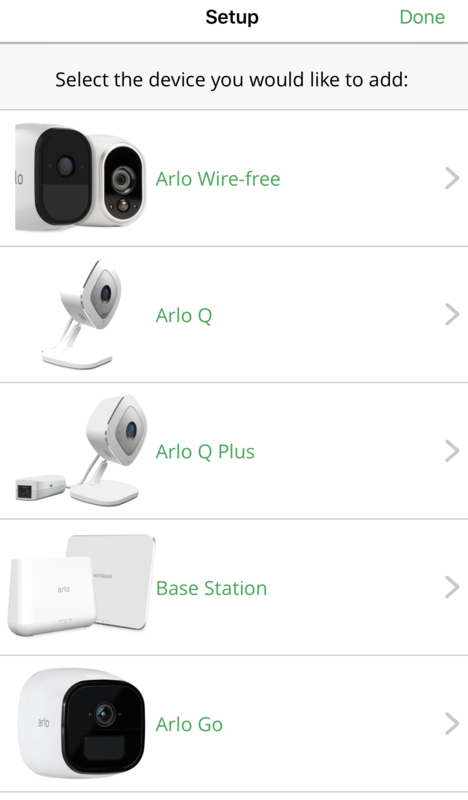 The Arlo app is the same for all Arlo cameras, and you can add to your existing cameras and keep them all together on one screen. 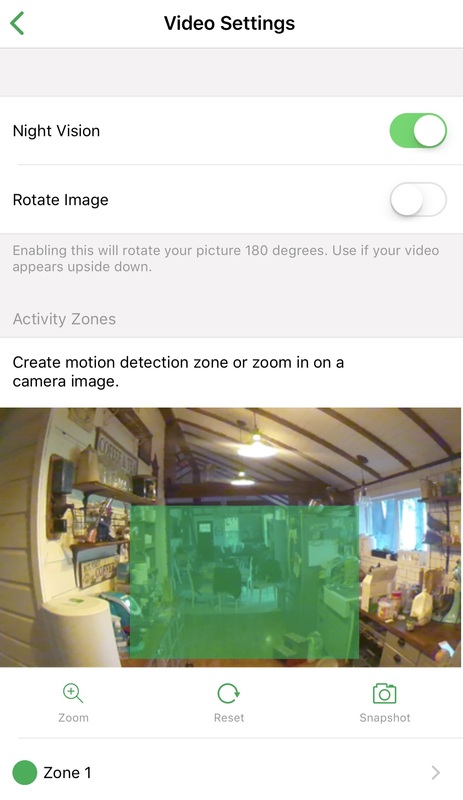 The app shows all of your cameras, and if you’d like to set a priority so one pops up at the top of the screen, you can do that. You can also see how much battery is left, what their signal strength is for your Wi-Fi, and set the specifics for motion and sound notifications. If you want to watch live video, you can just hit play. I’ve watched two live streams at one time, so if something was going on in one area or another, I don’t have to switch back and forth. You can record your own video any time, and you can download that video to your camera roll. You can also set a power mode within the app and optimize it for video quality or better battery life. Geo-fencing is an option if you’d like the cameras to only turn on when you’re out of range, or you can set them on a schedule so you don’t have to worry about turning them off or on. This home security camera integrates seamlessly with your current smart home, and you can even use it via IFTTT (If This Then That). I checked my list of devices for Google Home and I didn’t see Arlo listed, but you can use an IFTTT recipe to use Google Assistant to arm or disarm Arlo and it will. I’ve never been unhappy with any Arlo camera, and the Arlo Pro 2 is a major improvement over my current setup. The 1080p HD video is excellent and lag-free when you’re watching; the basic, free cloud storage plan is more than enough to suit any home owner’s needs; and the crystal clear sound and extra-loud siren are great upgrades. I also love that you can use these indoors, because that gives you full coverage inside and outside your home. Check out my video for a full view of Arlo Pro 2, and you can find these amazing home security cameras on Best Buy right now. Any comments on whether the base station to camera connection works through brick and concrete walls? In my experience it does, but I’ve placed mine as close as possible on either side of the walls. If you’re between concrete and you’re placing the camera quite a distance from the base station, you can get a repeater to boost your signal. Love the wireless feature …If I leave for an extended vacation ..say 3 months … What can I expect ? Sorry, I didn’t see your comment until just now. Unless you had them plugged in somehow, the cameras would need to be recharged after a few weeks. You can run these on the Arlo Solar panels too, so that might be an option to keep them going without a recharge. Elite plan for $14.99 USD per year or $149.99 USD per year. I really enjoyed your post, I live in Winnipeg and have been looking for a wireless exterior camera. I’m assuming that this would not work in a Winnipeg winter? They are rated to -20, so while they may work, you’d definitely experience a significant battery drain in some severe Winnipeg temps. I lived in Regina for a long time and I remember it often hit -40 on the prairies. That being said, I have a cousin who uses Arlo in Saskatoon and she brings it inside and puts it in the window facing out on those severely cold days.